If you're required to report AVETMISS or funded training there are a few steps you'll need to take to ensure that reporting time goes as smoothly as possible. Do these things before you accept your first enrolment into the VET classes. Set up your AVETMISS details within the General Preferences window. To access this, in the navigation menu click File > Preferences > General, then find the AVETMISS tab in the left-hand column on the window. 'Show RTO related screens and menus' should be enabled. 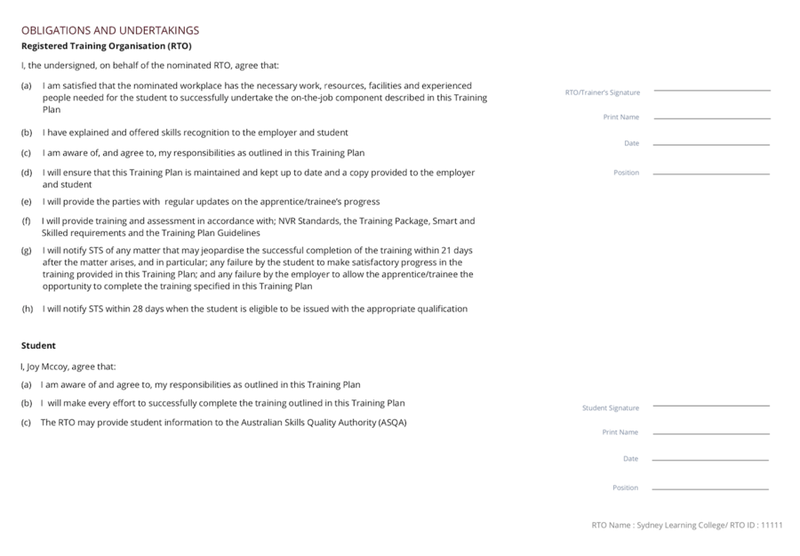 Then fill out the rest of the page and be especially certain that both your Training organisation name and RTO Identifier field match the details recorded on training.gov.au. When you've finished, hit the 'Save' button in the top-corner of the window, then close it. onCourse tracks VET competencies such as Qualifications, Accredited Courses, Skill groups/sets, Units of Competency, and Modules. It also tracks higher education Courses and Units of Study. onCourse automatically imports all this data regularly from training.gov.au. 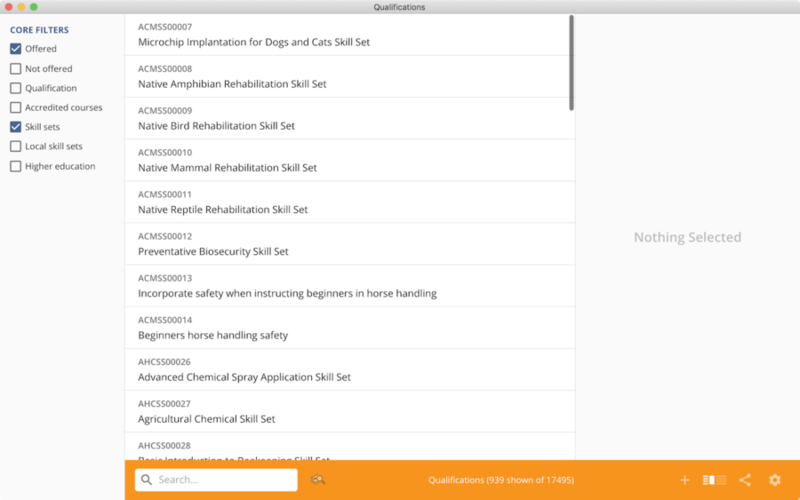 The can view Competency Components from the Training menu. For each competency on your scope, tick the 'is offered' option; this will ensure that only those records can be added to your courses. 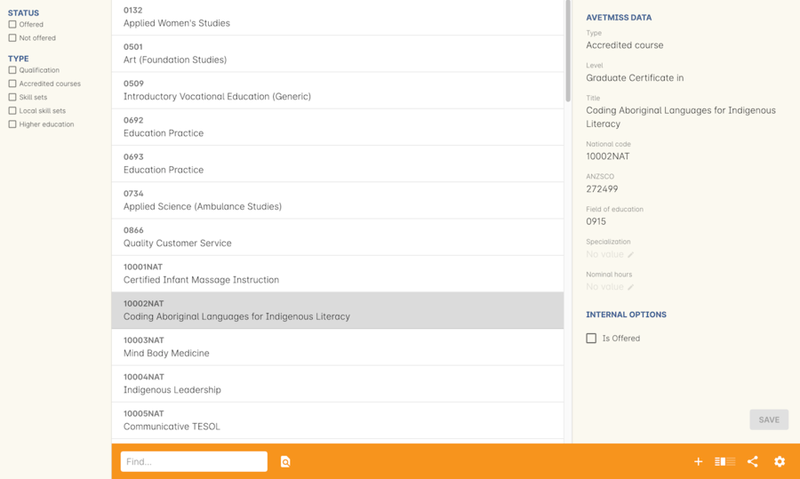 You can also create your own competencies for Skills groups, modules and higher education which aren't imported automatically from training.gov.au. Make sure you remember to add the correct funding contract at the Class level, and then make any required changes for individual students at the Enrolment level. To learn more about Funding Contracts, click here . You should ensure that all of the sites you've set up have the correct address, suburb and postcode. Any sites that are used for VET classes will have these details included in reporting, so ensuring accuracy in this data is important. You can learn more about adding Sites and Rooms by clicking here. 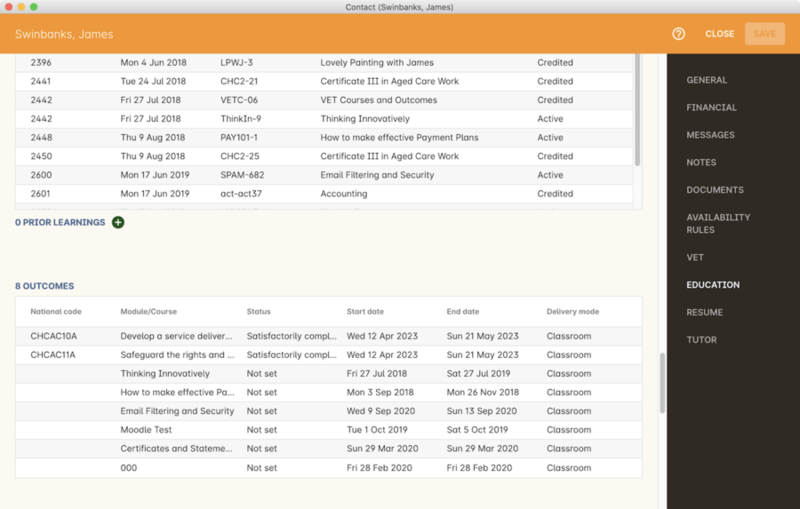 However - you can always retire the old course and create a new course to use for future enrolment using the 'duplicate course' option in the list view cogwheel. The new course can have the same name but will have to have a different course code. You may choose to change the code of the old course instead, so the new course can use the existing code, which is advantageous for your SEO. Make sure to set the status of the old course to 'course disabled' and when you are ready, the status of the new course to 'enabled and visible online'. 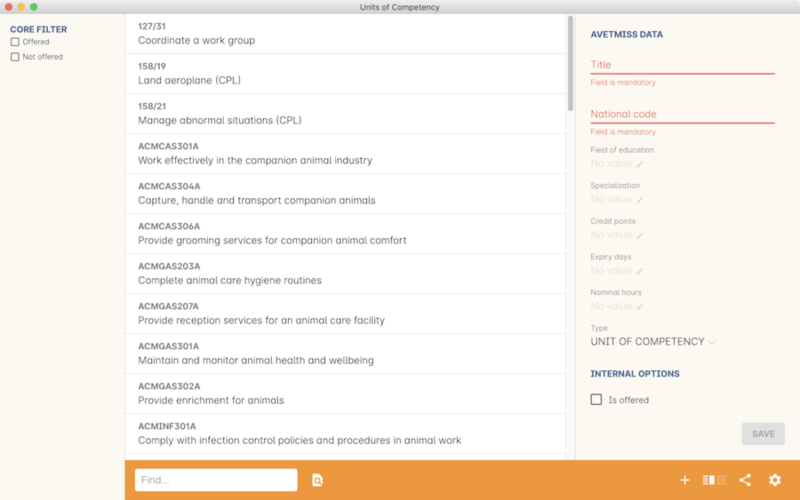 You can add your own modules and units of competency to the onCourse system from within the Units of Competency window (Training > Units of Competency) by clicking the + button in the bottom navigation panel. It will open a new column in the window where you must enter a title, the national code, the field of education code, a credit points value and an expiry days value. You cannot save the record without these fields being filled. After filling these fields, the save icon will become enabled. Click the icon to save the record. 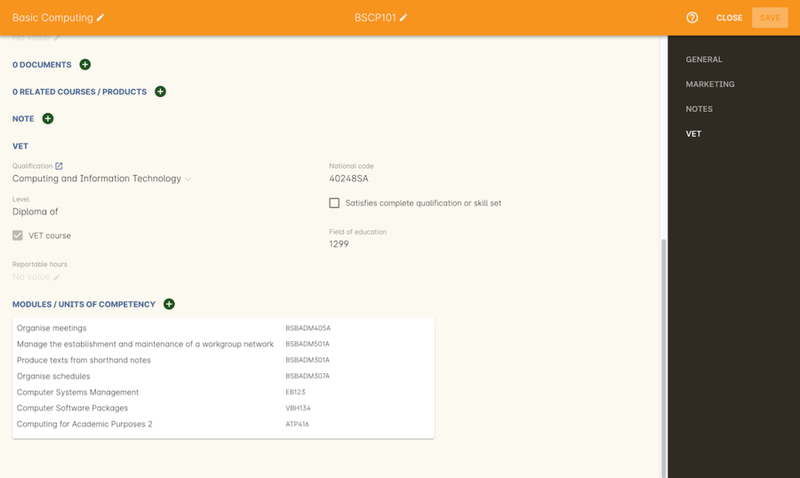 There is an additional field for specialization, however this is not mandatory in order to save the record. There is a check box called 'Is Module'. If checked, then the record will be classed as a module for use within a qualification. If this is not checked, then the record is considered a unit of competency for use within non-accredited courses. There's also an 'Is Offered' check box that, when ticked, flags that UoC as being offered by your college. You can delete a custom record by highlighting it and clicking the cogwheel icon, then clicking delete record. You can only delete custom records. 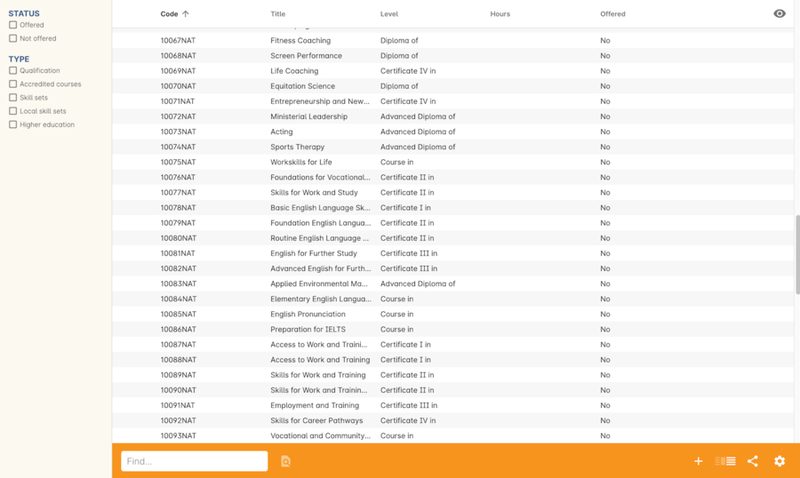 From within the Qualifications window (Training > Qualifications) you can create your own Qualifications and Skill Sets. There are four mandatory fields that must be filled out before the record can be created: Type, Level, Title and National Code. 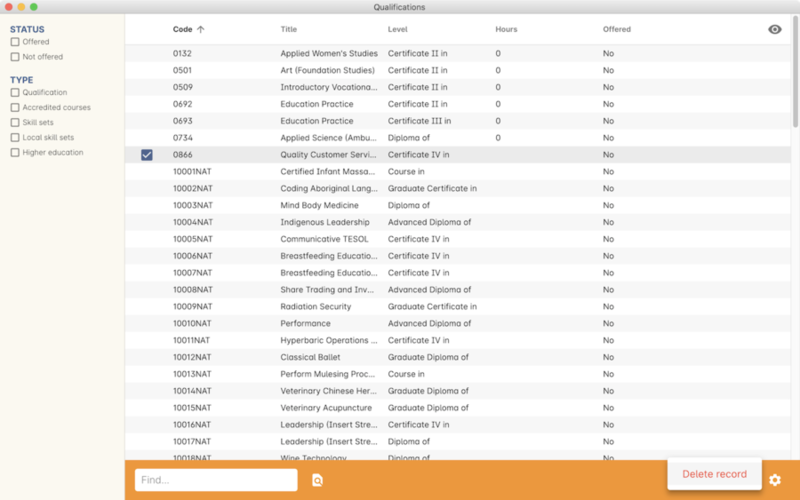 The Type field is a drop-down box that will allow you specify the type of record; a qualification, an accredited course, a skill set, a local skill set, or higher education. Level, title and national code are all free-text fields. Additional fields include the ANZSCO number, field of education code, specialization code and the number of nominal hours. There's also an 'Is Offered' check box that, when ticked, flags that qualification as being offered by your college. Where a class has multiple units of competency assigned to it, you may wish to create a training plan to define at which points during the class delivery each unit begins and ends. For some government funding training, is it important in the AVETMISS reporting to show the sequence of the delivery of units by having varied start and end dates. Training plans allow you to achieve this. Training plans are linked to sessions and can be found in the class timetable. By default, all units of competency are assigned to all sessions unless you choose to change this in the training plan. Units can not be assigned to no sessions as they would then have no start or end date, creating errors in AVETMISS reporting. The Training Plan report allows you to provide hard copy evidence of the outcomes delivered in each sessions of you class and the tutors you have assigned to deliver them. This report may be useful to provide to government funding bodies or ASQA auditors, as well as being used for internal planning and resource management. For an existing VET class, open the class record and go to the Timetable tab. Select a session from the list to view the Training Plan in the left hand panel of the timetable. By default, all the available units will be ticked. You can tick all/ untick all as needed to start preparing the training plan for that session. Progressing through each session, select and de-select the units in the left hand panel which will be delivered in that session. Note that the first session where the unit is delivered and the last session where the unit is delivered will become the start and end dates of the outcomes. If there are sessions in between these two where the unit is not selected, this will have no impact on your AVETMISS reporting, only your internal resource management. For each session in the timetable, you can define one or more tutors and one or more units. These combine to form the training plan. Once the class record has been saved, the start and end dates now set for each unit are available on the class Outcomes panel, in the training plan section. The lower half of the window shows the outcomes assigned to student enrolled in this class. The start dates and end dates defined by each unit must fall within the sessions of the class. You can not manually set a date in a training plan outside the class boundaries, but you can do this on an outcome by outcome basis if required. If a student's outcome has been modified manually e.g. the end date has been extended beyond the duration of the class, the Training Plan settings will not modify the manual overrides you have created. To print the training plan report for class, save and close the record and ensure the class is selected in the class list view. Select File > Print > Training Plan to print the report.